Any consultant can give better advice when on site as compared to looking at pictures and drawings from a distance. 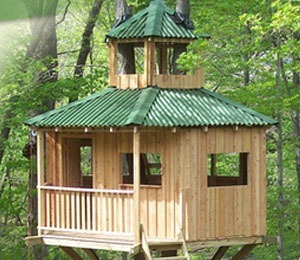 If you bring us out to the location of your tree house, we can help you choose the best trees, tell you how we would build the tree house, or inspect an existing tree house. Please use these rates to estimate how much the consulting or site feasibility study will cost. Consulting Rate: $150 per hour. Daily or weekly rates available for extended engagements. Travel Rate: $75 per hour. Office/Support Rate: $75 per hour. Actual transportation costs – (airplane tickets, government mileage rate, rental car, etc.) It’s okay for you to use your miles to buy the ticket. Actual lodging costs – Or a reasonable per diem for your location, or we can stay in suitable lodging that you provide. Per Diem Rate for meals & incidentals based on location, unless meals are otherwise provided for. The hourly rates apply to actual time traveling & working. We always provide estimates and can sometimes lock in a total price with you based on the above parameters. Site Visit Consulting Engagements in the continental USA generally cost between $100 and $4000 including all costs above. We generally drive if it’s within 7-10 hours each way, and fly out of Philadelphia (PHL) when it’s farther than that. Please call for details on trips outside of North America or any trips longer than 3 days (including travel). For additional tree house consulting services, consider our Distance Consulting or Contact Tree Top Builders for more information.